Simple blood tests can lead a doctor toward a diagnosis of blood cancers, like leukemia, lymphoma and myeloma, but to really see what’s going on, he or she needs to go to the source of the problem: the bone marrow. Examining maturing blood cells from the marrow with a microscope is an important step in staging the disease and developing a plan for treatment, but it’s a tedious and error-prone process that requires a doctor to classify and tally a dozen or so different cells based on their size, shape and features. Automated systems like flow cytometry and image analysis software can help, but in an austere environment, a doctor might not have access to these. Luckily, there’s now an on-line app to assist with bone marrow cytometry. Thanks to [Eduardo Zola], a doctor can concentrate on classifying cells without looking up from the microscope, and without dictating to an assistant. Keys are assigned to the different cell morphologies, and a running total of each cell type is kept. With practice, the doctor should be able to master the keying for the various cells; we suspect the generation of physicians that grew up with the WASD keying common in PC-based gaming might have a significant advantage over the older docs when it comes to learning such an app. [Eduardo]’s app seems like a simple way to improve on an important medical procedure, and an enabling technology where access to modern instrumentation is limited. To that end, one area for improvement might be a standalone app that can run on a laptop without internet access, or perhaps even a version that runs on a smart phone. But even as it is, it’s a great entry for the 2015 Hackaday Prize. We’re taking a field trip from the backyard, garage, and basement hacking in order to look in on what research scientists are up to these days. A group from the Johns Hopkins Institute for NanoBioTechnology has been manufacturing quantum dots for use in the medical field. Made up of Cadmium Selenide, this is a nanomaterial that you can think of as individual crystals of the smallest size possible. 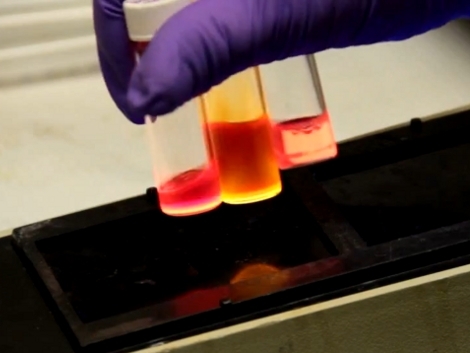 Quantum dots have many uses. Here, [Charli Dvoracek] takes the recently manufactured dots and activates them with antibodies capable of targeting cancer cells. Once mixed with a biological sample, the dots embed themselves in the walls of the cancer, allowing the researchers to find those cells thanks to the phosphorescent properties of the dots. The video after the breaks walks us through the various steps involved in growing these dots. [Charli] has the benefit of a fully outfitted lab, using tools like an argon-filled glove box to protect her from harmful off-gases. You’re not likely have this sort of thing in your home laboratory, but as we’ve seen before, you can make some of your own equipment, and produce interesting chemicals with simple processes. If you’re someone who already tinkers with chemistry experiments we want to hear about your exploits so please drop us a tip about what you’re up to. This is Precious. Precious is a bike that the folks over at BreakfastNY have anthropomorphised for a good cause. By adding sensors for a variety of data sources to the bike, and transmitting them back to a server via a cellular module, Precious can spit out cheeky comments about the ride on its Twitter feed. Right now Precious is on his way across the country powered by his rider, Janeen, to raise money and awareness for cancer research. You can track the progress, enjoying some attractive web design and reading the oft-beligerant comments from the bike, at yesiamprecious.com. Although there’s no specifics about the hardware, we saw the typical project box during the teaser video. Inside you’re sure to find the usual suspects. 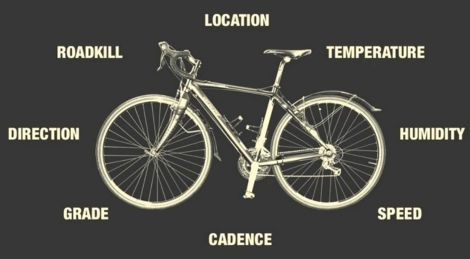 Considering that speed, cadence, grade, temperature, humidity, and GPS data are all available on high-end bike computers we hope they found a way to just read in that data. But your guess is as good as ours; start speculating in the comments.